The WK-7600 provides 820 world class tones organized by category in a new easy-to-use interface. Dynamic stereo pianos, vintage electric pianos, strings, drums and a wealth of synths and acoustic instruments are at your fingertips. Each of those 820 voices can be edited with control over filters, envelopes and more. For added depth and realism, an extensive set of DSP effects are available to enhance these tones, providing you with pure inspiration at your fingertips. You can’t miss them, nine strategically placed sliders on the front panel. Just press the Drawbar Organ button and start playing. The sliders allow you to control the level of each harmonic overtone to produce a powerful and rich organ sound. Rotary speaker effects and percussion control are all instantly accessible. For the final touch, you can dive deeper into edit mode to customize key click, overdrive, rotary speeds and more for the ultimate drawbar organ experience. With the new WK-7600 you can capture those moments of creativity so they’ll never get lost. Featuring a powerful 17-track sequencer, you can even edit and tweak your performances enabling you to turn out broadcast ready, professional tracks. Once you’ve created your masterpiece you can save your song file to an SDHC card. Better yet, you can save it as an audio recording. That’s right, this new keyboard can mix down internally and save your new song to an SDHC card as an audio file. This allows you to share your music with the world. Utilizing Casio’s free DATA Manager 6.0 computer software your recording can be converted into a .WAV file, so you can burn your song to a CD, put it in your favorite music player, send it to friends or a record producer. Making music and sharing it has never been this easy or affordable. Casio continues the tradition or providing “class compliant” USB connectivity on Workstation digital pianos. This allows Casio Workstation digital pianos to be used with Mac or Windows computers without the need for downloading drivers. Class Compliant USB MIDI also allows Workstation digital pianos to be used as a controller for the Apple iPad simply by using Apple’s Camera Connection Kit. The WK-7600 offers 64 notes of polyphony so you don’t have to worry about dropping notes. Using the sustain pedal for multiple notes, playing big chords, adding rhythms and layering sounds can deplete the polyphony memory quickly resulting in dropped notes. When searching for a keyboard, take the amount of polyphony into consideration. 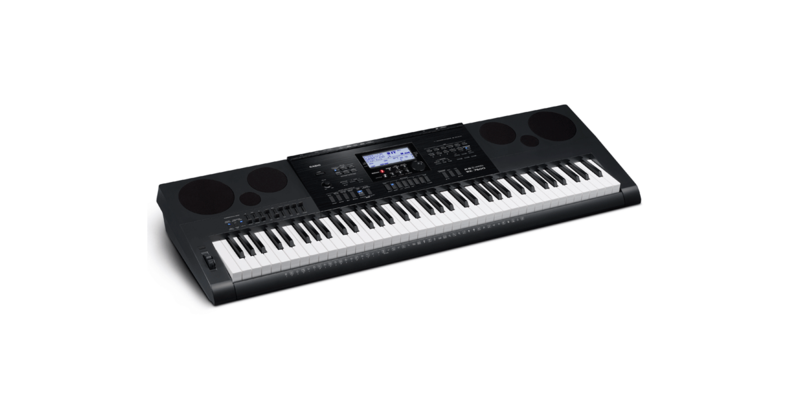 Casio’s WK-7600 includes 260 preset plus 100 user-created rhythms, more than other keyboards in the same class can offer. Additional rhythms expand your music composition, creativity and fun. A total of 260 preset rhythms with full accompaniment are built-in. One button click brings you access to styles from rock, pop, Latin, jazz, country, classical and everything in between. You can choose to have just a drummer or full virtual band at your disposal, so now you can play and write music with more speed and sophistication than ever before. Whether you’re playing live or in the studio, you have total control over your mix. The front panel sliders provide quick control over volume, pan, effect sends for each channel including the MIC and instrument inputs. The back panel provides 1/4" (L/MONO, R) outputs, MIC and Instrument inputs and a stereo audio in. There is also a class-compliant USB MIDI port. This means you can easily use your favorite computer music application without the need for drivers. The WK-7600 is ready to conquer the stage. You can easily create splits, layers or both simultaneously. You can store this combination of three tones as a registration for instant recall on stage. The 96 registration slots will let you cover any gig, or save those magic sounds that define a new hit song. If you’re a solo performer, registrations can also recall rhythms and accompaniments for you to play along with. The WK-7600 features a piano-style touch- response keyboard that provides a realistic piano experience. Casio’s portable keyboards offer a plug and play advantage over other brands. Feel free to connect an iPad, PC or Mac without the cumbersome process of downloading drivers. The WK-7600 features 820 tones to expand your music creativity. Considerably more choices than other keyboard companies offer in comparable models. 46.7" x 15.7" x 5.9"
49.5" x 19.5" x 8.0"